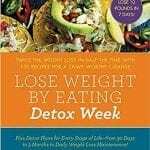 Kale smoothie recipes are some of the most popular green smoothie recipes in the world, and also one of my favorites thanks to how great my body feels after enjoying them. Kale is what’s known as a “superfood”, which means that it’s packed with an exceptional amount of nutrients and is extremely healthy for you. It’s actually considered one of the most nutritious vegetables you can eat (X). 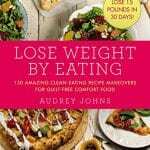 It’s low in calories but big in nutrition, helping you fill up fast to lose weight quickly. 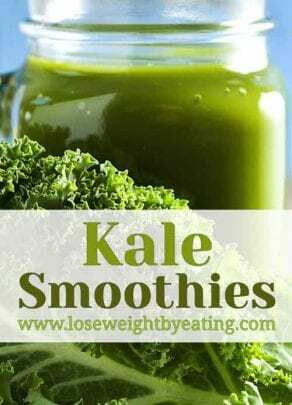 In this article I’m going to discuss what a kale smoothie is, how to make a kale smoothie, and I’ll even provide you with 11 delicious kale smoothie recipes to get you started. What is a Kale Smoothie? 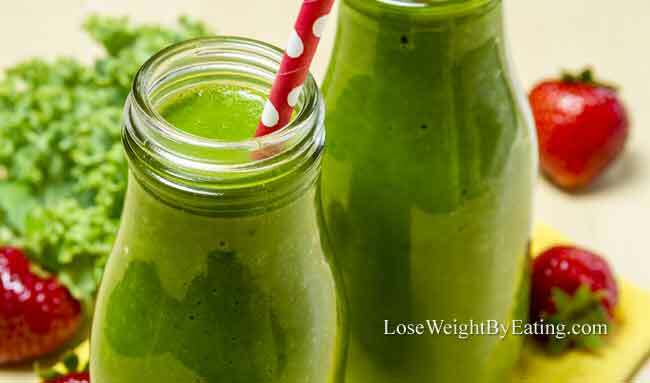 A kale smoothie recipe generally consists of 1 to 2 cups chopped kale leaves (ribs and thick stems removed), ½ to 1 cup of almond milk or Greek yogurt, fruit, and ice cubes. 1-2 teaspoons of honey is sometimes added as an optional sweetener. Kale is a leafy cruciferous vegetable similar to cabbage, broccoli, or Brussels sprouts. There are several varieties with different colors and shapes. Kale is also very high in antioxidants including beta-carotene and Vitamin C. It also contains the compounds Quercetin and Kaempferol, which has been shown to help fight cell damage and lower blood pressure (1,2,3). Clean and remove thick stems from kale leaves. Place chopped ingredients into a smoothie blender. Blend until smooth. Add a liquid like almond milk or ice to thin out if needed. Pour into two medium size glasses. These ingredients are based on making 2 servings. I also recommend you serve these kale smoothies quickly since they generally taste best when cold. Special Tip: For these kale recipes, cut or tear the leaf part off the stem so you have just the leafy pieces remaining. 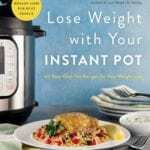 Wash and dry the leaves and then freeze into 1-cup servings. This way you’ll have the exact amount you need without having to cut it up every time. 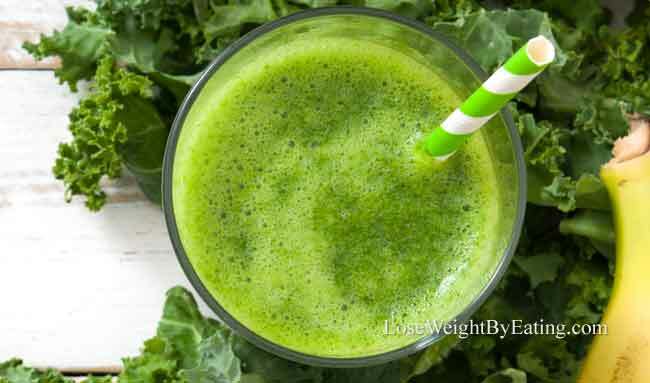 The 11 kale smoothie recipes below use a variety of ingredients to provide a unique and delicious smoothie experience. My favorite fruits to use are bananas, strawberries, and pineapple. What’s yours? Please share in the comments at the bottom of this post. Enjoy! 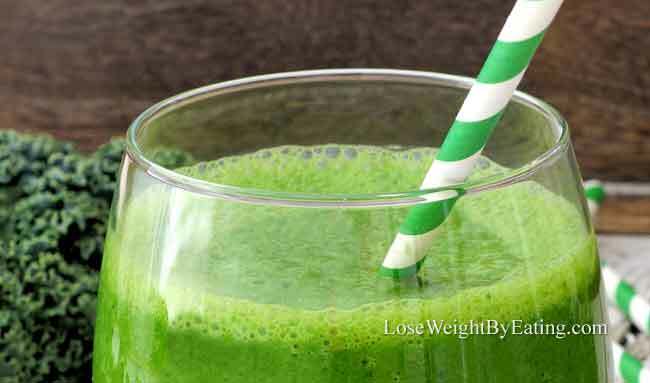 This delicious Kale Banana smoothie is a family favorite around our house. It’s easy to make and is loaded with a ton of healthy nutrients. Bananas are a great sources of potassium, which is imperative to healthy kidneys and controlling blood pressure (4). One medium sized banana only contains 105 calories (5). They’re also high in fiber. Eating foods that are high in fiber and low in calories like bananas have been shown to help with weight loss (6). 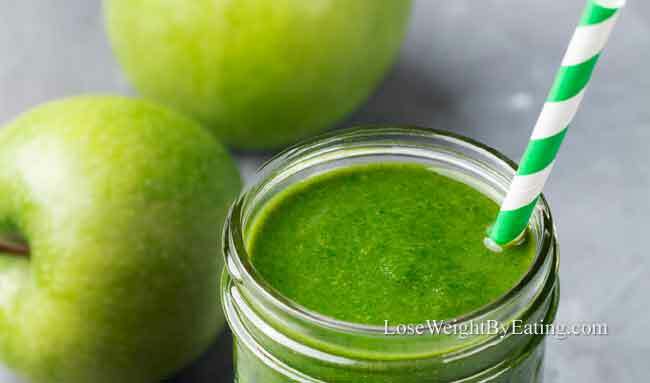 I enjoy this Apple Kale Smoothie often because the ingredients are always on hand. Kale and apples are staples in my kitchen and it’s rare when I’m not stocked up on these two nutritious foods. Apples are a good source of fiber and vitamin C. They also contain plant compounds called polyphenols, which can have numerous health benefits include lowering the risk of cancer, heart disease and assisting with weight loss (7,8,9). Eating at least one apple per day has been associated with lowering the risk of Type 2 Diabetes and decreasing blood sugar levels (10). My daughter loves the new Wonder Woman movie. I tell her that if Wonder Woman drank smoothies, this would probably be her favorite. 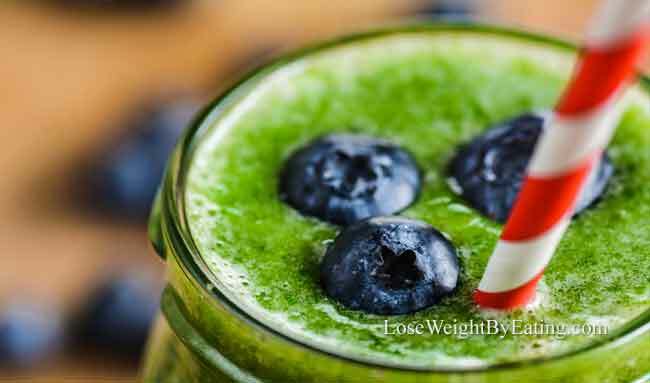 This Kale Spinach smoothie is not only loaded with nutrients, it also tastes yummy, too. Spinach and kale are two of the most nutrient dense foods on the planet and have been shown to help fight all kinds of health issues. Spinach has also been linked to lowering the risk of prostate cancer (12). 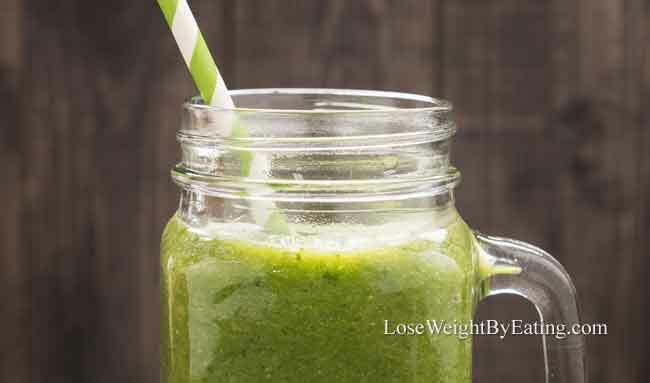 This Kale Almond Milk Smoothie is a great example of when simple meets healthy. It is super easy to make. I often reach for this smoothie for breakfast on days when I’m not overly starving or as an afternoon snack. Almond milk is not only dairy free, but it’s also very low in calories, typically half that of even skim milk. That’s especially true when you use unsweetened almond milk (13,14). A unique benefit from almonds is that it has been shown to reduce the “bad” LDL cholesterol in your body and increase the “good” HDL cholesterol (15). Blueberry Kale Smoothies are wonderful on hot days because they’re surprisingly refreshing and not too thick. This recipe is easily thickened if so desired, but I like it as is, icy, healthy and delicious. Kale and blueberries are both low calorie superfoods that help fight cancer, lower blood pressure and together bring an incredible amount of vitamin C (16,17). Blueberries have also shown the ability to improve memory loss, which makes this a good recipe for older adults at risk for dementia (18). I love the creamy and luscious flavor of mangos. This Kale Mango Smoothie always reminds me of a tropical beach. Mangoes are a low calorie fruit with high amounts of Vitamins A and C. These vitamins are great for your immune system and eye health (19). Mangoes are also high in plant compounds and antioxidants that have been shown to lower the risk of chronic diseases and cancers (20). 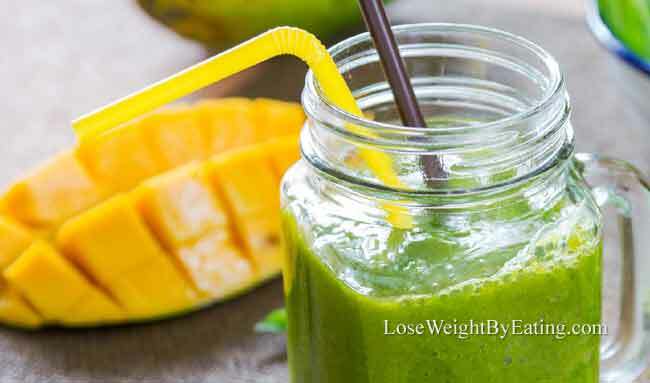 This Kale and Pineapple Smoothie recipe is like drinking a tropical dessert full of nutrition that’s delicious no matter the season or weather. It’s a healthy treat that’s easy to make and very good for you, too. The combination of kale and pineapple deliver a hefty amount of vitamins C, K and plenty of manganese (21,22). Bromelain, only found in pineapples, is a plant compound that is associated with many unique health benefits including: reducing inflammation, lowering cancer risk and improving gut health (23,24,25). When I first I tried this Strawberry Banana Kale Smoothie I knew I had found my new healthy sweet tooth fix. This is an easy sell to the kids as well as being loaded with healthy ingredients. The anthocyanins in strawberries help give them the bright red color but also help with decreasing the risk of cardiovascular disease. Strawberries also assist in lowering oxidative stress, which helps lower the risk of both types of diabetes (26,27,28). 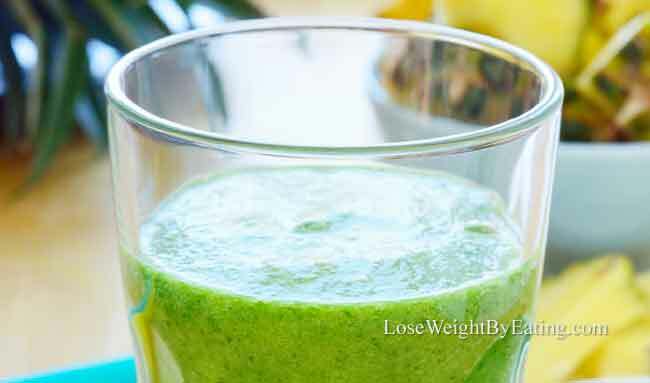 This Kale Yogurt Smoothie makes a great breakfast smoothie to start your day. It’s packed lots of with protein and nutrients. I’ve always been a big fan of Greek yogurt over regular yogurt because it’s simply better for you. Greek yogurt can contains lots of protein, much more than regular yogurt, which not only gives you more energy it also helps with appetite suppression (29,30). It’s lower in natural occurring lactose (or milk sugar) than regular yogurt, and is also a good source of gut repairing probiotics (31). 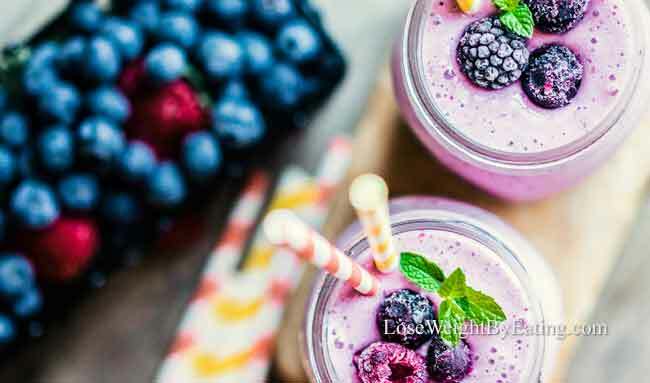 Berry Kale Smoothies are delicious no matter which berry you use to make it. I like to try different berries based on what’s in season to keep my taste buds surprised and happy. This tasty Kale Peanut Butter Smoothie just so happens to be vegan without even trying and leaves me with no desire to reach for a snack after. 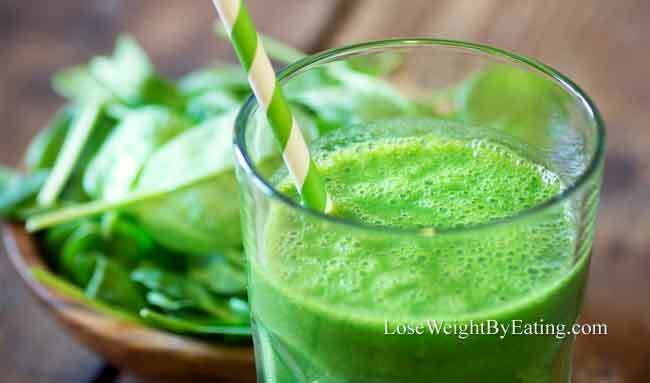 Any of these kale smoothie recipes can help with weight management and improved overall health, and I recommend you try them all to see which one you like best. Also try experimenting with exotic fruits, or other vegetables like carrots or celery to give it a different flavor and nutrition profile. 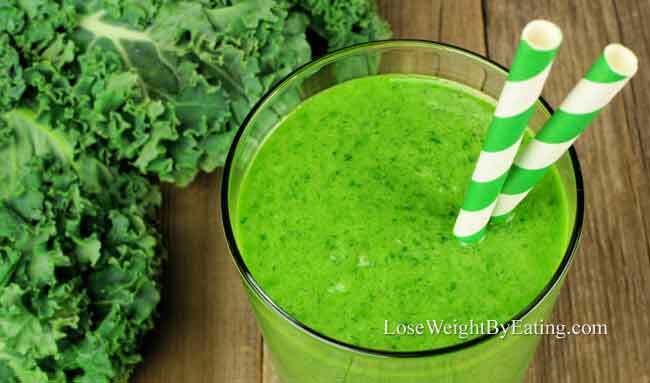 No matter which recipe is your favorite, if you drink these kale smoothies on a regular basis, you can bet you’re providing your body with the nutrition it craves and it will respond with better health.